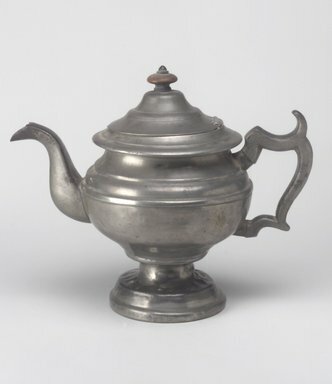 Pewter teapot with hinged lid, raised on pedestal. Stepped, circular pedestal supports generally spherical body. Top half of body stepped and has molded bands; flares out sharply to form edge of collar, collar tapers up to round opening. Stepped dome lid with rounded knob finial of wood attached to body with hinge along edge. Attached handle, generally C-shaped with curving extensions at corners. Opposing attached spout in gently curving S-shape, tapers to diagonally cut mouth. CONDITION: Fair. All-over tarnish, pitting, and scratches; unusual dents and bulges around shaft of pedestal (heat or other severe damage? ); several dents around body; dark discoloration around pedestal, handle, and spout; white-colored corrosion around opening, edge of lid, and joints of handle and spout; large, rough yellowish corrosion mark on side of body near handle.